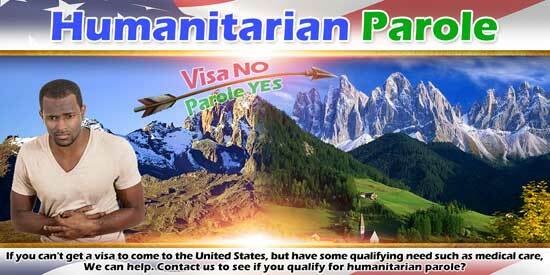 Do you need humanitarian parole? We can help. We mostly work with clients in Montana, North Dakota and Wyoming, but can help you where ever you are located. In brief, If you already know what humanitarian parole is and why you need it, you can contact us. But, if you are learning about humanitarian parole, this article is part of our guide to US visa types. Please keep reading for more information. Humanitarian parole is for those people located outside the United States who are either inadmissible or have been refused to visa, but have a strong humanitarian interest in admission to the United States. Examples are always helpful in translating these concepts to the real world. We present two examples, one in family law, and one involving medical need. In the first example, consider a US citizen who was married to somebody without status in the United States and had children. Next, let us assume that the person without status was removed from the United States. If the US citizen then started a petition to terminate the person without status’s parental rights, how could that person participate in the court hearings? This previously removed alien may be eligible for humanitarian parole to participate in hearings about his or her children. For the second example, consider somebody with a serious medical condition in a country with limited access to medical care. If the person remained in his or her home country, he or she might die. The person needing the medical care applies for a visa to come to the United States, but the consular officer denies the application. If medical care for that person’s condition was available in the United States, under certain circumstances, the person needing the medical care might receive humanitarian parole to get the needed medical care. If you would like to read about someone we helped receive humanitarian parole for urgent medical care, you can review our post on Rogers Ssembatya. Anyone requesting humanitarian parole must support his or her application through sponsorship. The USCIS considers a US citizen or lawful permanent resident the most reliable sponsor. The sponsor will need to provide evidence of identity. Additionally, the sponsor must show the ability to financially support the person who will receive humanitarian parole. Above all considerations, the person getting the benefit of admission to the United States must not be a financial burden to the United States. With these concepts in mind, the sponsor must submit USCIS form I-131 naming as the beneficiary the person seeking humanitarian parole. The sponsor must also submit financial records showing how the petitioner will sponsor the applicant for humanitarian parole while present in the United States. According to the USCIS, One of the most common types of humanitarian parole requests is for medical reasons. In these cases, the USCIS requires specific documentation to help it decide whether the request for humanitarian parole is worthy of approval. The most important documents to secure relates to the nature and severity of the medical condition. In addition, a physician must provide documentation providing a diagnosis and prognosis of the applicant’s medical condition. The physician should also be able to explain the treatment needed to fix the applicant’s medical condition. In describing these problems, the physician should also explain why the applicant needs treatment in the United States, and if treatment is available in the applicant’s home country. With the description of the applicant’s medical problems professionally described, the USCIS now wants to know how that medical problem is going to be addressed in the United States. The sponsor must provide official documentation from a physician or hospital in the United States to provide the treatment necessary to fix the problem described. Besides having this treatment plan, the USCIS requires the sponsor to state who will pay for this needed care. If the medical facility is donating the care, the USCIS will need a signed contract for that care. If the sponsor intends to pay for the required care, he or she must provide proof of ability to pay. The USCIS now reviews the completed request and determines whether your application should receive expedited processing. Having classified your request, the USCIS now decides whether you deserve the benefit. If you were approved, the USCIS notifies you that you should now apply for the parole. You do that using the standard visa request process at a US consulate in your home country. Once you receive the travel document, you can plan your trip to the United States. With the travel document, CBP will admit you, paroling you into the United States. If you need humanitarian parole, we can help you evaluate your case, and the likelihood of success. We can prepare humanitarian parole applications. If you need help, please contact us.